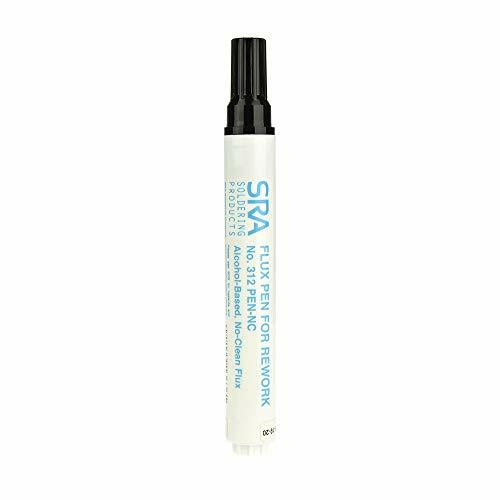 Description Liquid Flux No-Clean in 10ml (0.34oz) Pen w/tip Flux Type: No-Clean Liquid Flux (for Leaded and Lead-Free applications) Flux Classification: INM0 Packaging: Pen 10ml Shelf Life Refrigerated >24 months, unrefrigerated >24 months Storage and Handling Store refrigerated or at room temperature 3-25C (37-77F). The liquid flux can be allowed to freeze. 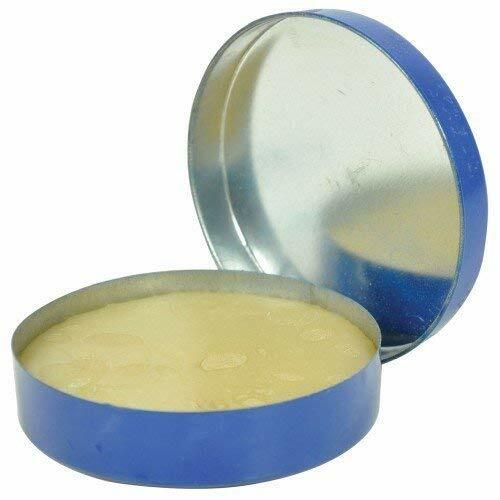 Freezing will not degrade this product. 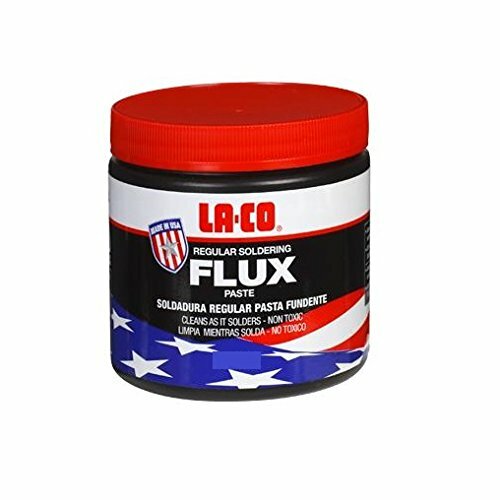 Allow 4 hours for liquid flux to reach an operating temperature of 20-25C (68-77F) before use. Transportation This product has no shipping restrictions. Shipping below 0C (32F) or above 25C (77F) for normal transit times by ground or air will not impact this product's stated shelf life. 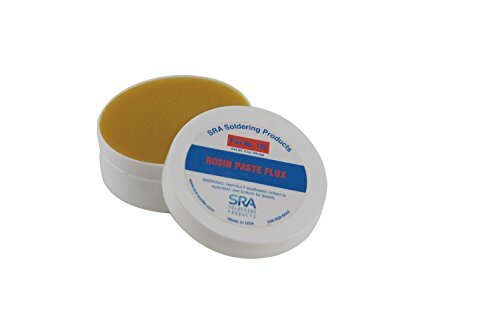 The 835 Rosin Flux contains a type RA rosin-activated flux composed of pure Water White (WW) grade gum rosin. 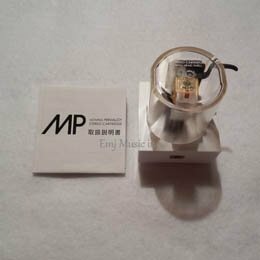 It is a unique solvent system that contains very effective activators. The superior fluxing remains consistent throughout the entire aeration process. The 835 provides fast wetting action and complies with all requirements for type ROM1 flux per J-STD-004. 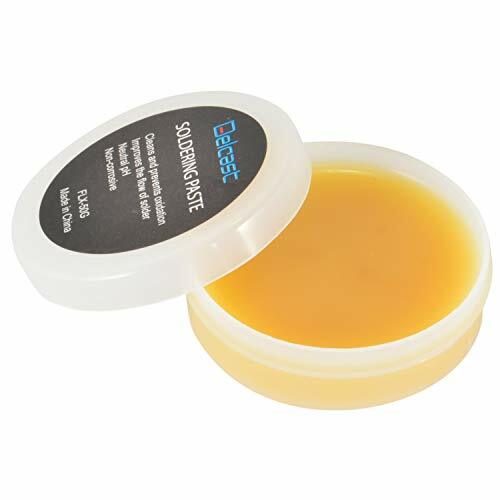 Application: The rosin flux is designed for leaded and lead-free chemistries. 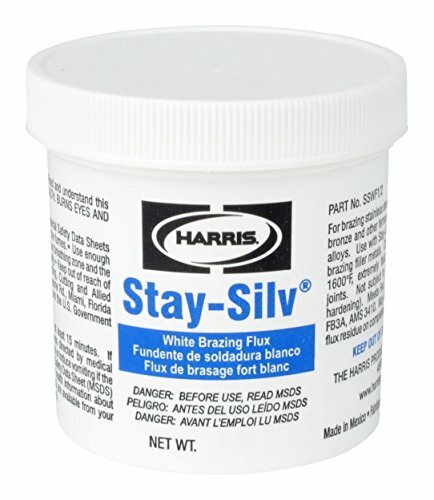 Excellent for prototyping and rework/repair on printed circuit boards. Works well on chip carriers, heat sinks, surface mounted device pads, switches, and sockets. 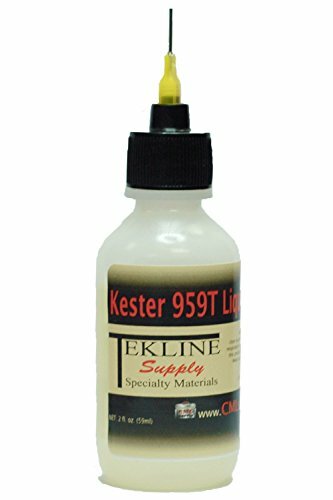 Kester 959T is a non-rosin organic flux that is specifically designed for rework of conventional and surface mount circuit board assemblies. The extremely low solids content and nature of the activator system results in practically NO RESIDUE left on the assembly after soldering. There are no residues to interfere with electrical testing. Kester 959T exhibits improved soldering performance to minimize solder bridges (shorts) during rework operations. 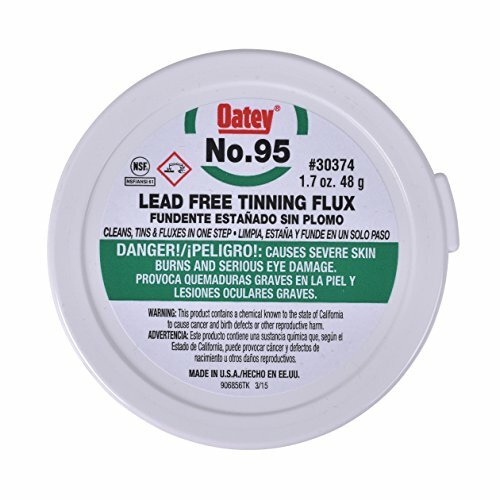 Lead Free - RoHS compliant. Remove QFDs, PLCCs, SOICs and chip components without costly and complex equipment. 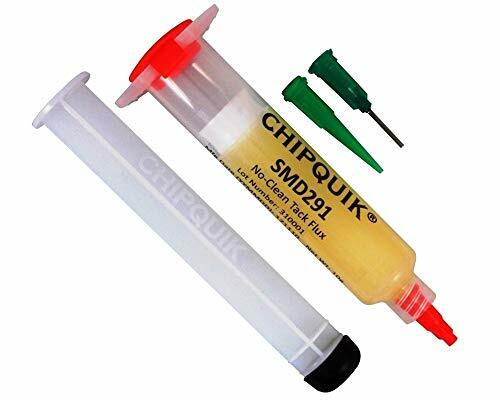 Use ChipQuik with your existing rework equipment or temperature controlled soldering irons. Special removal alloy has excellent wetting ability with a low melting temperature of 136F (58C). 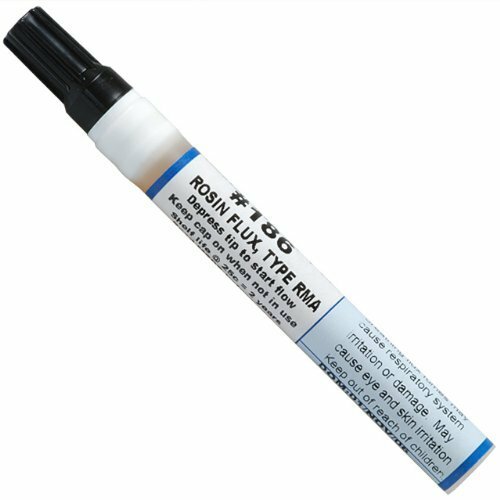 To use: apply paste flux to all leads with syringe; melt ChipQuik alloy on all pins of SMD; with wide iron tip; maintain alloy in a molten state long enough to release chip; lift chip from board with pick-up tool. Safe, affordable, easy and won't damage sensitive components. NoClean Paste Flux; 10cc syringe with tip. J-B Weld 8217 TankWeld Gas Tank Repair - 1 oz. SteelStik is a hand-mixable, steel-reinforced, non-rusting epoxy putty that quickly repairs or rebuilds anything made of metal. After mixing, it forms an industrial-strength polymer compound that can be molded into shapes or used to build up, patch and repair steel components. SteelStik sets in 3-5 minutes and after 60 minutes, can be drilled, tapped, machined, ground, filed and painted. SteelStik cures to a dark grey color, is rated at a tensile strength of 900 PSI and will withstand temperatures up to 300 F.
JB WELD STEELSTIK: Is a hand-mixable, steel-reinforced, non-rusting epoxy putty that quickly repairs or rebuilds anything made of metal. Steelstik will withstand temperatures up to 300 degrees F.
SIMPLE TO USE: SteelStik sets in 3-5 minutes. After 60 minutes, can be drilled, tapped, machined, ground, filed and painted. Curing to a dark grey color, it is rated at a tensile strength of 900 PSI. VERSATILE & DEPENDABLE: Ideal for automotive, brick, ceramic, concrete, metal, underwater and wet use, exhaust systems, plumbing, stripped threads, rust damage, household repairs and more. Solder Flux Pen. Made in United States. Classified as ROL0 per J-STD-004. Manufactured by Kester. Easy and flexible to use. 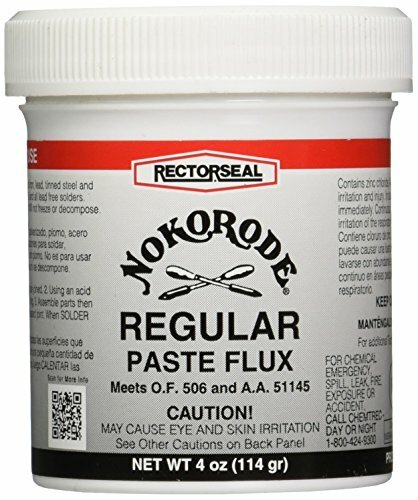 NOKORODE REGULAR PASTE SOLDER FLUX LEAD FREE, 4 OZ. ALSO USE WITH PATINA: use either the same paper towel or a clean one to apply the patina. Mixing the Kwik-Clean with Patina gives added cleaning of the flux and a finer tone on the patina. After Patina is applied, clean again with Kwik-Clean. Polish as you normally would.